RTC Institute partners with colleges and universities to bring high quality, convenient, graduate courses and programs to educators. The college and university partners define all application, matriculation, course, and graduation requirements, and grant graduate credit. RTC Institute serves as the local sponsoring partner for these courses and programs by bringing the courses and programs to local sites. RTC Institute cannot grant graduate credit or degrees. Only our collaborating higher education partners can do so as per their accreditation by the state of New York. Students who have questions or concerns about their academic status, grades, or official transcripts should contact the college or university. College of Mount Saint Vincent offers a wide array of courses that can be taken for graduate or in-service credit. Please check with your individual district for approvals. RTC collaborates with Dominican College on the Rockland School Health and Wellness Coalition and community initiatives such as Leadership Rockland. RTCI works with Long Island University on Regents Review courses in science and math. RTC collaborates with LIU on the Rockland School Health and Wellness Coalition. RTCI collaborates with Marist College on teacher education issues through our work with the New York Association of Colleges for Teacher Education(NYACTE). RTCI collaborates with College of Mt. St. Mary on teacher education issues through the New York Association of Colleges for Teacher Education(NYACTE) and on teacher preparation initiatives with New York State Association of Teacher Educators(NYSATE). RTC collaborates with Nyack College on the annual early childhood transitions conference. RTC collaborates with St. Thomas Aquinas College through a literacy initiative, which includes free after-school professional learning for educators and support staff. 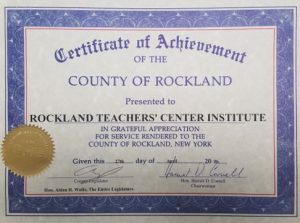 RTCI works with STAC to support Rockland Reading Council, the local NYS Reading Association member council, and on community initiatives. 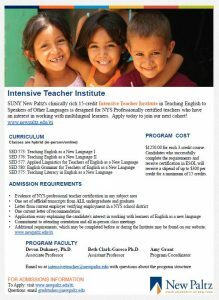 SUNY NewPaltz’s clinically rich 15-creditIntensive Teacher Institute in Teaching English to Speakers of Other Languages is designed for NYS Professionally certified teachers who have an interest in working with multilingual learners. RTCI collaborates with SUNY Purchase on content area trainings in Math and Science, as well as Regents Review in math and science. All programs are aligned with next-generation Science and Math standards. RTC collaborates with Rockland Community College on the Rockland School Health and Wellness Coalitionand community initiatives. RTCI collaborates with Rockland Community College on teacher education issues through the New York Association of Colleges for Teacher Education(NYACTE) and on teacher preparation initiatives with New York State Association of Teacher Educators(NYSATE).